Hide deals from seller "FT Fitness Together"
Limit 1 per person, may purchase 1 additional as a gift. Vaild on 1 month of small group personal training. By appointment only; must mention voucher when scheduling. Valid at Palatine location only. Must present voucher to redeem. Working out alone is difficult because it's tough to stay motivated, and it's easy to convince yourself to drop the weights and pick up a burger instead. 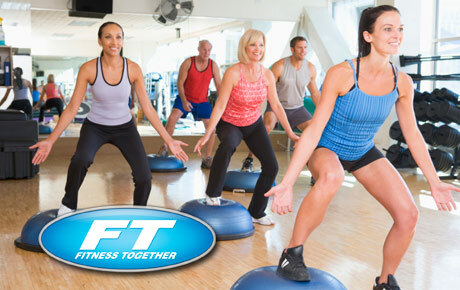 Shed your undesired pounds with a strong support group using this deal for 65% off one month of personal training from FT Fitness Together ($289 value). You will be trained by experts in a small group of 2-4 people with similar goals and strength, meeting twice a week for four weeks. FT Fitness Together in Palatine is offering PACK, a powerful new dimension in their training regimen that optimizes your fitness goals. PACK adds a strong group dynamic to strength training, cardio conditioning and nutritional guidance to help you reach your optimal health with other like-minded individuals. With a private and comfortable atmosphere, FT Fitness Together will get you results without the distractions. Offers personal training in small groups and nutritional consultation.